After a coat of primer, it was time for the top coat coat on the walls. 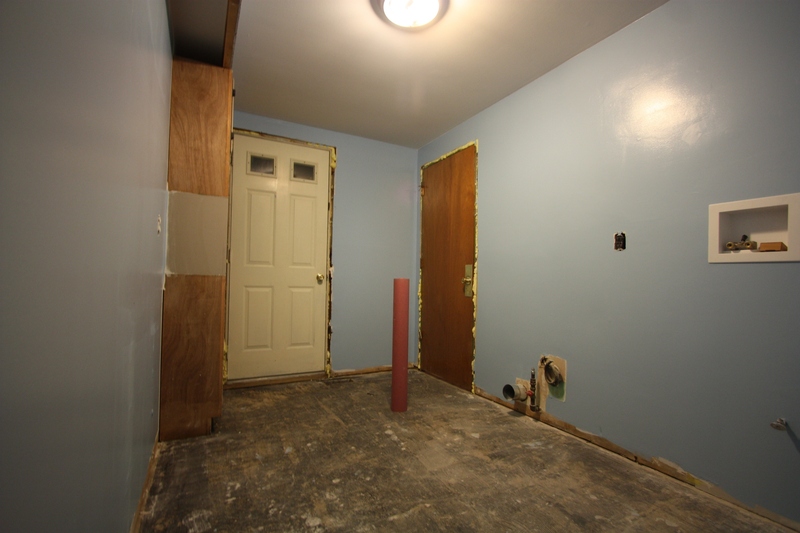 This nice blue color was actually one of the rejects from the master bathroom. It’s Valspar’s Premium semi-gloss Beautiful Blue. While we didn’t like it in the bathroom, I think its a great color for the laundry room, and a vast improvement over the old wall paper. A nice relaxing day today, as we drove from Cortina back into Austria and stayed at Innsbruck. As we drove into Innsbruck I was surprised to see some clouds in the middle of the mountain. I’m continually amazed at the amount of truck traffic on the European roads. I had been under the impression that since Europe has such an extensive rail network, and fuel costs are so high there that there was very little shipping done by truck. At least where we were that is completely untrue however, as there were even more trucks on the road than even a typical American highway. We got to Innsbruck around lunch time and had a frustrating time finding something to eat. I was trying to avoid another pizza place, and it seemed like every other place was full of smoke. Attempting to find a good place to eat is defiantly my least favorite part of any vacation and its even more difficult in foreign countries. We eventaully found a nice little bread and sandwhich shop, and from there we went on to a bell foundry. We had a nice look around there and learned some about bell making which turns out to be a bit more complicated than I would have thought. 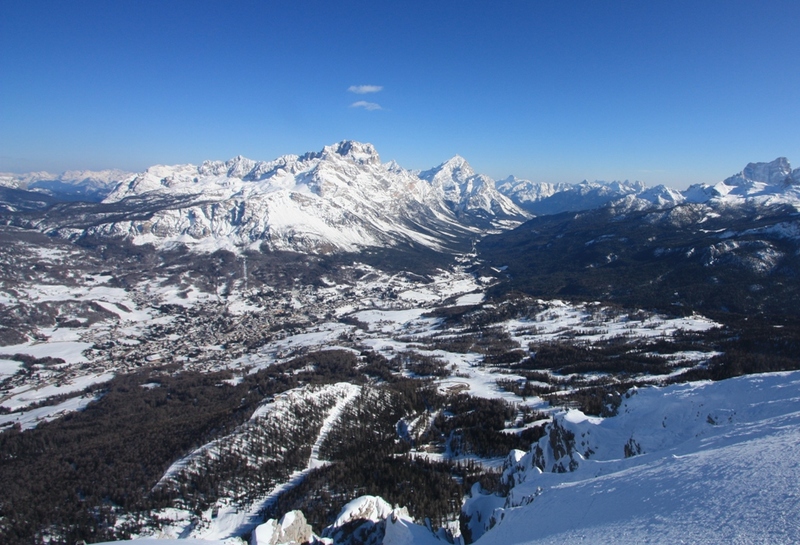 Day 8: Skiing in Cortina D’Amprezzo! We arrived in Cortina a bit later than I wanted to, as I still needed to rent some ski’s figure out where the lifts where and how to get there. 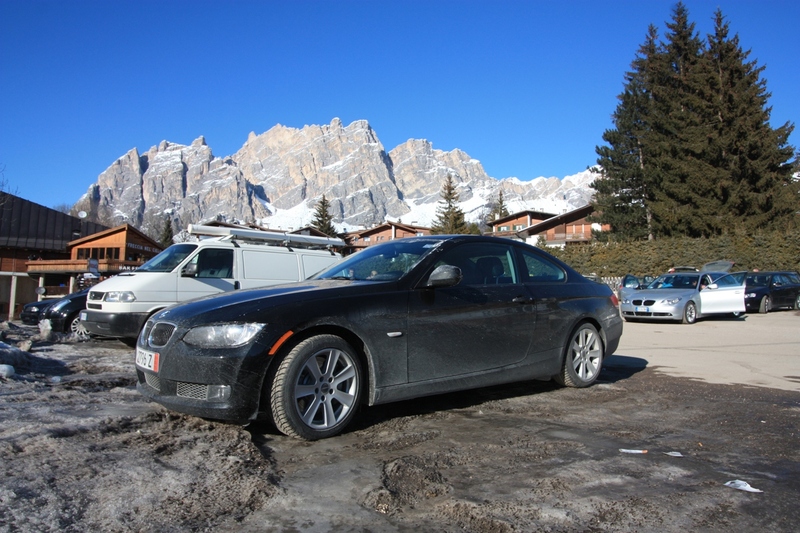 Cortina isn’t like a typical American ski resort with a nice big centralized base lodge, there are instead little parking lots at the base of each lift. 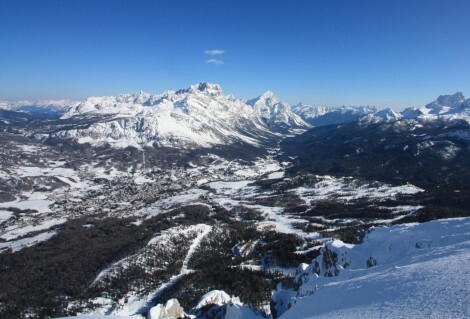 Since Cortina sits in a little valley (thats in in the left center of the picture above) you can on any of the mountains around it, and the base lifts aren’t anywhere near each other. I choose the mountain on the west side, as it looked to have the most trails, and the gondola was only a 30 second drive from our hotel. Renting skis was the next big challenge. There are a bunch of little ski rental places, of which to choose from and since I had no internet access to look at reviews or anything I picked the one that looked the biggest, and was closest to our hotel. Of course this place turned out to have almost all cross country skis, with just a few down hill. Something I should have noticed but really, whats the point of cross country skiing? Since they didn’t have any boots that fit my freaky big feet, the guy there was nice enough to recommend a shop a little down the street. This place was great and the staff spoke excellent English. I got boots that fit pretty well, and the biggest pair of ski’s they had, some 182cm Atomic Giant Slalom Race 10. The next morning I grabbed my stuff and hopped on the gondola. This wasn’t the gondola type that I’m used to with little cabs that hold 8 or 10 people and go by every minute or so, this was a big ole 80 person gondola, that only went every 15 mins or so. 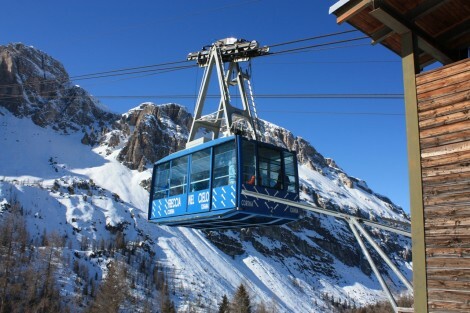 From that gondola, I got on another gondola, and then finally a rather slow two person lift to get to the top of the mountain at about 9000′. Well not the actual top, that was another 600′ or so higher, but you can’t ski down from there, its only accessible by yet another gondola in the summer. 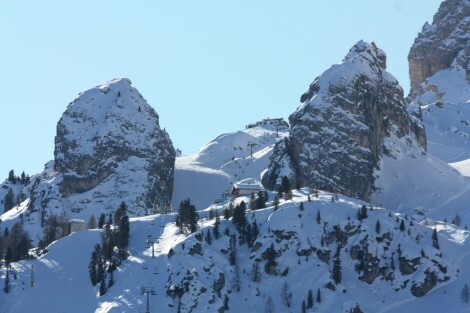 I skied around up there for a couple of hours, and was rather disappointed for a couple of reasons. First off its above the tree line so the runs are rather dull, just wide and pretty straight. Second off, the snow wasn’t good. I’m not sure what exactly it was, as it was freshly groomed, and wasn’t icy or anything, it just wasn’t fun to ski on. I think maybe it was to dry or maybe to cold. Plus the top of the mountain is served by a few older lifts, that are all pretty slow, and it was pretty crowded. So I stopped and had some gatorade and a delicious strudel and then bailed on the upper part and took a slew of trails all the way back down to the bottom of the mountain, about 6000′ down, and many miles long that took quite awhile. Once I got out of the top bowl I started having a great time. The snow down here was much better, the trail was great, meandering through the woods, and there was no-one around. Sadly though they had to go and wreck the last bit of the trail by putting a bunch of very tight slalom fences up so that you had to pretty much stop as the trail crossed a road. From there I hopped back on the gondola, to a quad lift, to another quad lift, and finally to a triple all the way to the top of another side. The conditions here were much better, although the snow still felt funny. I got to ski some great trails here including some of the trails used in the Olympics, and the trail I had watched Lindsey Vonn ski on in the world cup a few months ago. The lifts on this part of the mountain were also pretty new, so they were all high speed, and there were no lift lines either. Lastly here’s the obligatory car covered in salt with the mountains behind it pic. Today we left Salzburg to head over to Cortina D’Amprezzo. Its only a few hour drive, so we took John’s advice and stopped on the way at Konigsee. 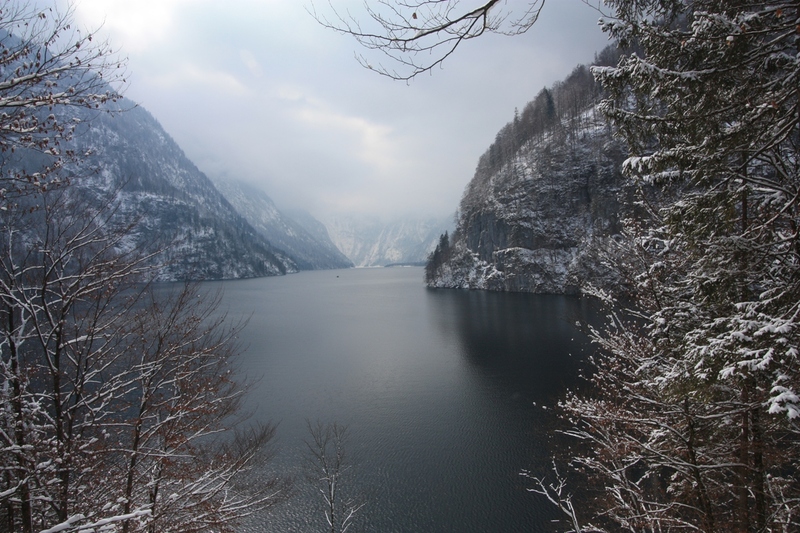 Its a lake that sits in the valley between some extremely tall and steep mountains, and is quite picturesque . It looked amazing in the snow, although the cloudy skies made for poor pictures. We took a short hike on some snowy trails around the lake, and I was also surprised to see a bobsled/luge track near the lake. There are only about 20 current tracks in the world, and almost all of them are at the site of a recent winter Olympics. This however is one of the exceptions, although it is part of th 2018 bid. From Konigesee it was back into Austria on our way to Cortina D’Amprezzo in Italy. Once again I was shocked at the complete lack of border between the countries, as the only thing of notice was a small sign with the new countries name. I’ve seen bigger signs coming into New Jersey. By stopping at Konigess we took a sort of back way into Italy instead of the highway. This proved to be a great choice as the drive was incredible. We hit very little traffic, and the views were ridiculous. The 10 euro toll was also a tad ridiculous, although at least the road was in great shape. Well yesterday we just got a coating of snow overnight, but today it snowed pretty much all day with a total accumulation of a couple of inches. Still that didn’t stop us from having a good time. In the picture above is the Castle we visited yesterday. 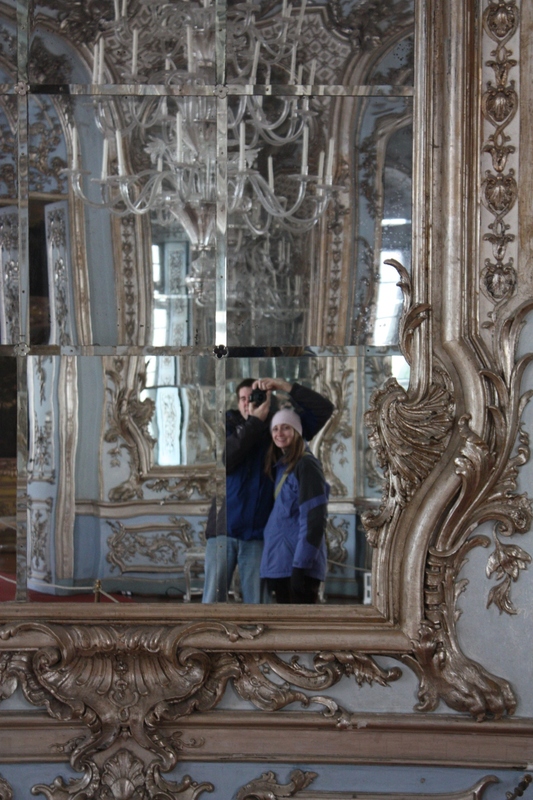 We first went to the Salzburg Museum. The museum is quite new, it looked like it had opened in just that last few years. 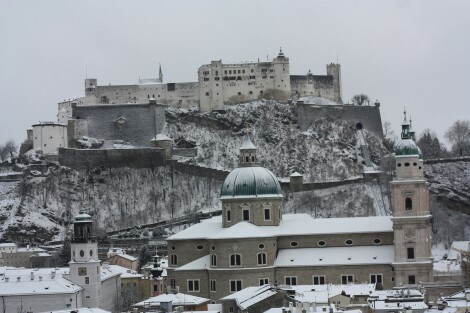 It was pretty nice, although since Salzburg is rather a small city (only about 150k people) there really isn’t a whole museums worth of interesting stuff. They tried anyway though, and as such we got to learn about a seemingly random women who lived 100 years ago and wrote some poetry. They did have some cool stuff though, particularly the 30′ tall 360 degree panorama of what the city looked like around 1850. Salzburg sits on a river between two large hills, which make it a great strategic point and combined with the nearby salt mines explain its existence as a small town even in roman times. 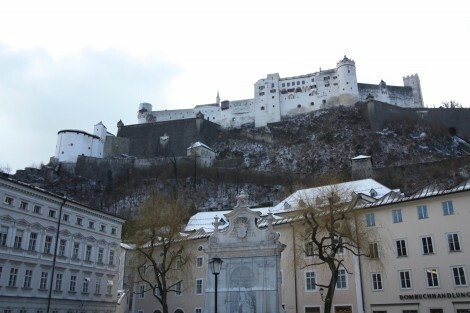 On the one side is the fortress we visited yesterday (and also in the picture above), on the other side is a monastery. It has no fancy cable railway, instead there are a whole bunch of steps. We climbed up them in the snow and got some great pictures of the snow covered city. We also went to mass this evening, and St. Sebastians, a rather small yet incredibly beautiful church on the newer side of town. The mass was in Latin, except for the homily, which was in German. Jess’s Latin is better than mine and she was at least able to get some of the prayers, where as I could only get phrases here and there. The only misstep of the day was when Jess accidentally got both the shrimp and the lobster at lunch, resulting in a rather expensive lunch. However, if the worst thing that happens on our trip is that we spend an extra 20 bucks on lunch, I will be overjoyed. Day 5: Snow in Salzburg! 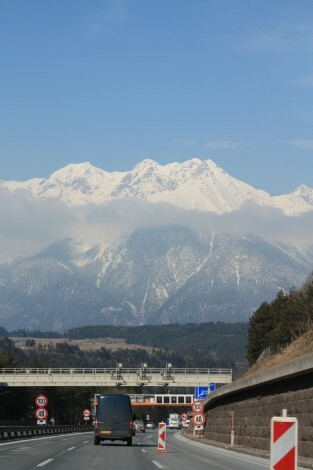 Last night we drove into Austria. I was a bit nervous about going through customs but it turned out to be ill-founded as well, there weren’t any. The EU seems to becoming more like the US all the time, as this trip was just as eventful as driving from New Jersey to New York. When we woke up in our lovely hotel and looked out the window though, we were surprised to see a decent coating of snow on the ground. 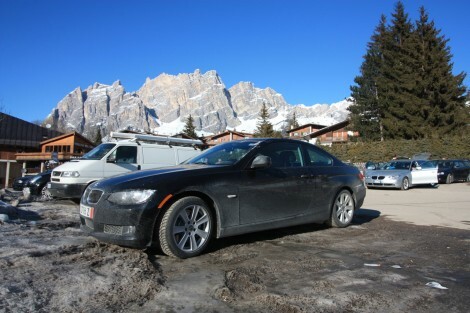 I was very glad to have rented winter tires for our trip through the Alps, as I doubt this will be the last we see of the white stuff. Salzburg is very nice little city, although a bit touristy. We seemed to have more difficulty finding good places to eat here however, and the places we did find were filled with people smoking. I’d forgotten how awful it is to go to dinner with someone smoking right next to you, it just makes all the food taste worse. 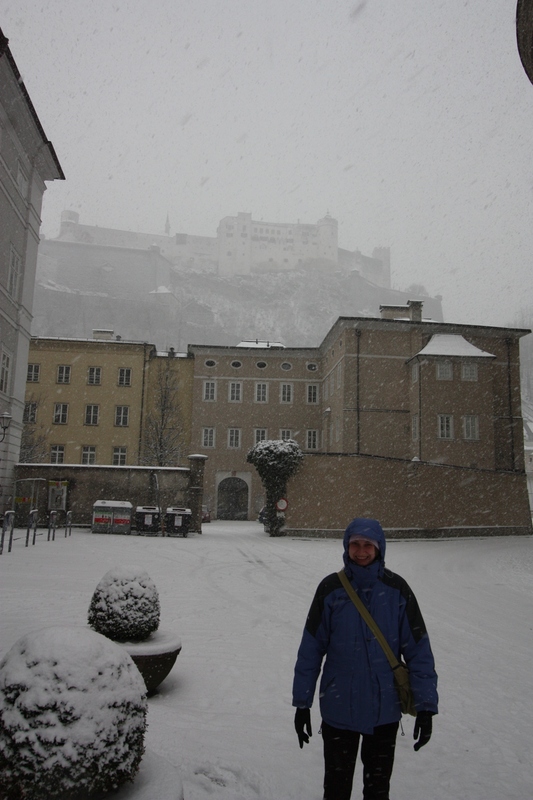 Salzburg only has 150,000 or so people in it, so its easy to walk around, and thats what we’ve been doing. Today we walked through much of the old city, which besides for the names on the shops hasn’t changed much in a couple hundred years. 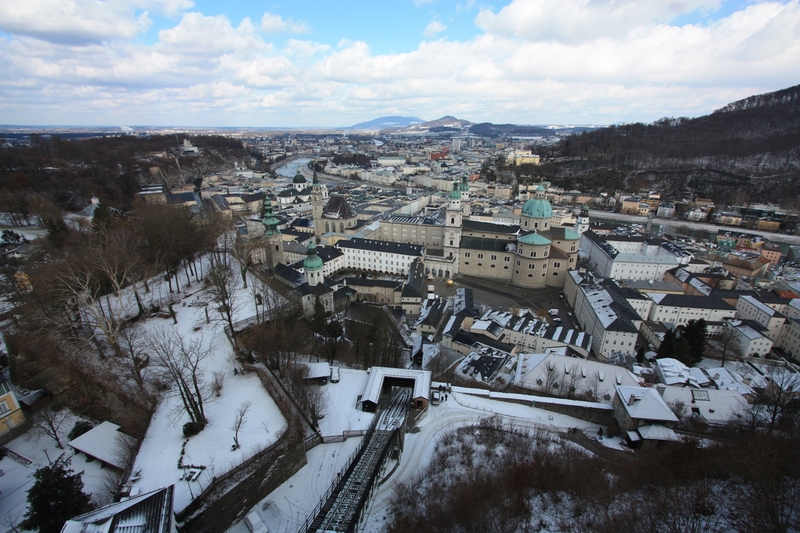 From there we took the cable railway up to the Fortress Hohensalzburg, which sits atop a large hill to the south of the city. Its a huge fortification that looks pretty much impregnable, and not surprisingly has never been taken by force. Of course for some reason they just surrendered it to Napolean. After lunch we went over to the Cathedral Dom, which was originally built around 700 AD, and then rebuilt again in the 1500’s, and rebuild again in 1959 after it got blowed up in WWII. 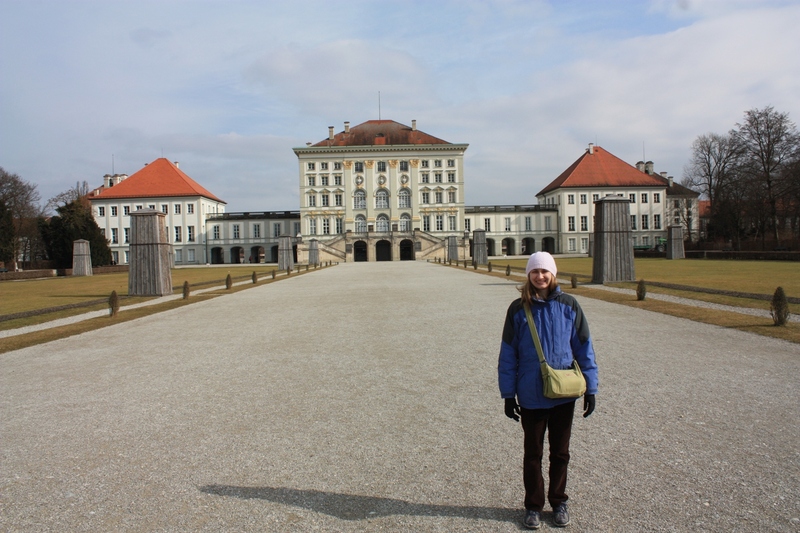 Today we went to Castle Nymphenburg, which is really a palace as it has no fortifications whatsoever. It is quite large and incredibly ornate, as you would expect of a king’s palace. What I found most interesting was that although it is currently just outside the city center of Munich, when it was built it was basiclly in the middle of nowhere. Of course because of that it means that it has a huge garden that is impecibly landscaped. Since it was still winter there wasn’t much there, but they had just put in a few pansies and by a few, I mean about 16,000. One of the smaller side palaces was unique in that it was trimmed out in silver, as opposed to the more typical gold. Although I suppose that might be because silver is more fashionable now. From there we got to have our first experiance with the legendary German Autobahn. This was promptly cut short as we had to get off to get gas… $100 worth of gas. When we got back to the autobahn we hit the first unlimited section which basicly felt like driving down the parkway. Driving in heavy traffic with every once in awhile hitting a break and getting passed by someone doing 130mph. The road itself wasn’t much different either, although it was only two lanes, and much twistier. I probably would have been more impressed if I was limited in my speed by the BMW’s break-in period, as well as the aforementioned crazy expensive gas, and the paranoid wife in the passenger seat. Day 3: Best Day Ever! 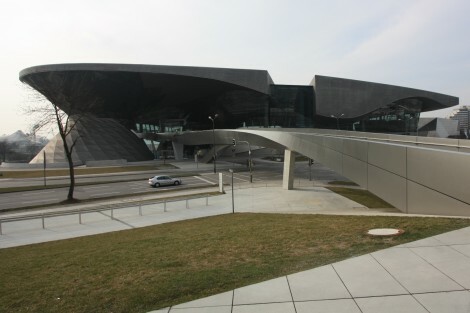 Today we went to the wonderful new BMW Welt to pick up my car. The whole experiance was amazing. Right fromt he get go they treated us like VIPs. After checking in we were given some little ID cards with our schedule on it, and brought to the ‘Premium Lounge’ where they had an amazing spread of food and drinks, as well as a plethora of leather couches to relax in. We got some breakfast and then headed off to learn all about my new car. They had a silly little simulator that showed all the fancy traction control features, as well as the first implementation of Microsoft’s Surface technology that I’ve seen. The electronic car that they were showing me around was an exact duplicate of my car, right down to the correct liscene plate. From there the big moment arrived when I was given the keys to my shiney new BMW 335i Coupe. 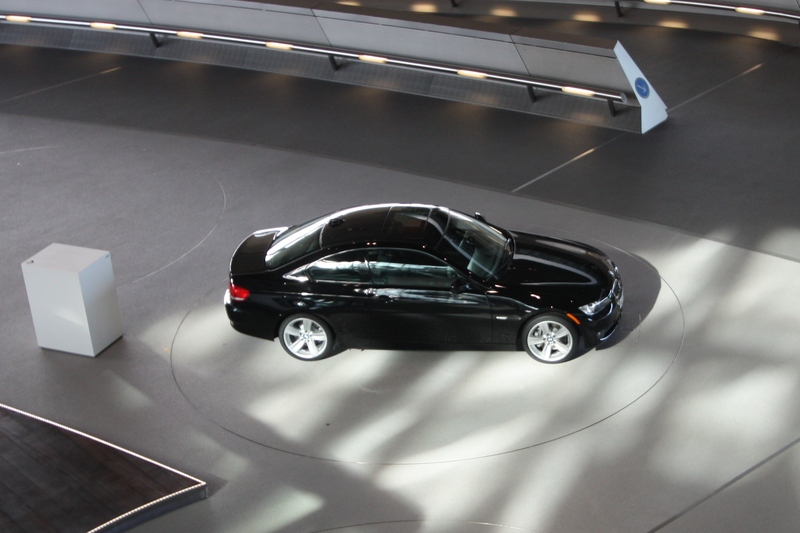 The car was in this unbelievable hall on its very own turntable, making the whole experience seem special. I got to drive the car around a bit and then it was time for our factory tour. 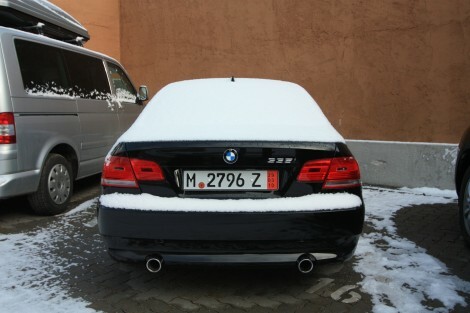 My car was made an hour or two up the road from Munich, however the factory here makes 3-series sedans and wagons. We saw a good portion of the factory, from the stamping line to the body shop to final assembly. Not surprisingly it wasn’t much different from many other modern car factories. Almost all of the welding and body work is done by robot, with the assembly being done largely by hand. Then after another small stop back at the lounge for a rest and some drinks, we went off to the BMW museum. Here they had pretty much everything BMW has ever made. From the first airplane engines all the way to some of the new concept cars. 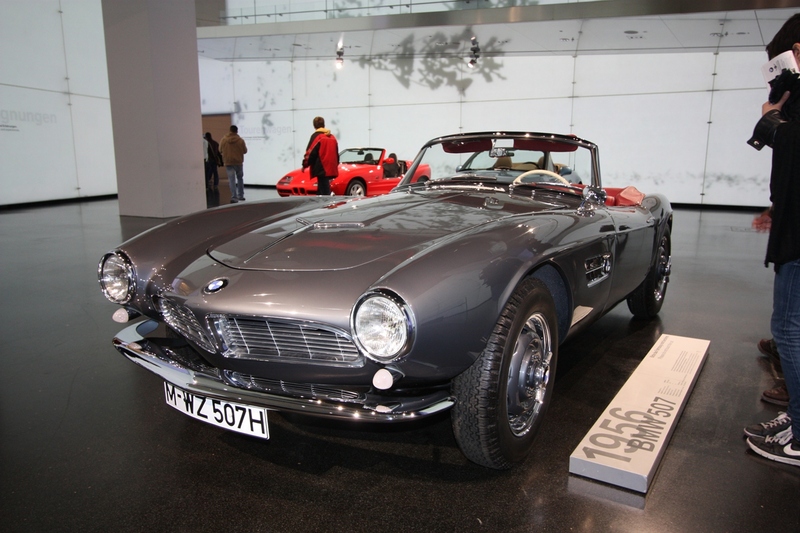 My favorite was this 1956 BMW 507 Roadster. At this point however we were rather exhasuted though so we kind of flew through the museum. 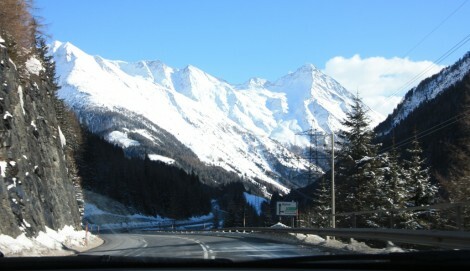 From there we headed off to get the winter tires we rented, to prepare for our upcoming journey threw the Alps. 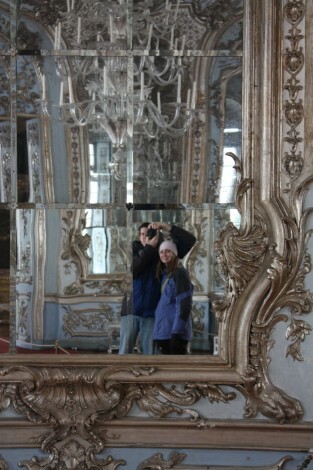 We spent yesterday sleeping and getting adjusted to the time difference and Munich. Today we wok up rather late and stopped at a little coffee house to get some pastries for breakfast. It was then off to the old city square where we saw the Glockenspiel that is in the ‘New’ City Hall. This would have been alot nicer if it didn’t involve standing around in the near freezing rain for half an hour. Then it was off to the fantastic Deutsches Museum. This is huge science museum that is much more adult oriented than most of the science museums in the US. 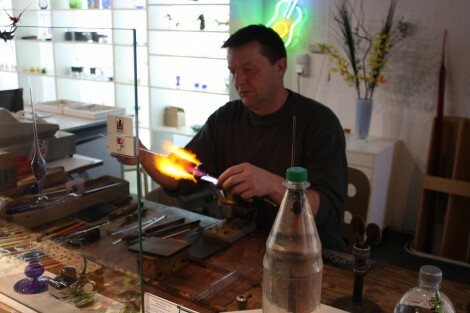 The guy above was giving a glassblowing demonstration. They has a bunch of great manufacturing exhibits on everything from food to glass to textiles. A decent amount of the plaques also had information in English, which made figuring out what we were looking at alot easier. They also seemed to offer alot of demonstrations and tours, unfortunately the glassblowing was the only one that appeared to be running today. From there we hit up a local grocery store to get some dirt cheap snacks and juice, and then went back to the hotel to take a nap. When you are used to sitting at a computer all day, walking all over a city and standing around looking at exhibits all day is very tiring. Then it was time to head to the art museum and get some culture. The Munich art museum is split into three, the old, new and modern. We went to the Old museum, which was quite large all by itself. 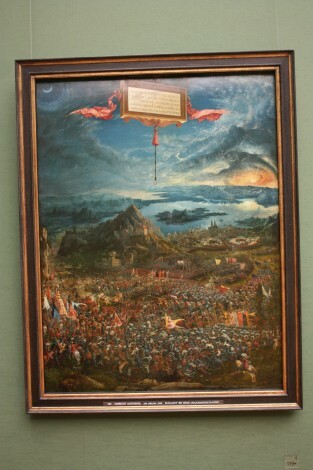 They had some great paintings there, with this being my favorite. It shows the battle between Alexander the Great and Darius of Persia in amazing detail. 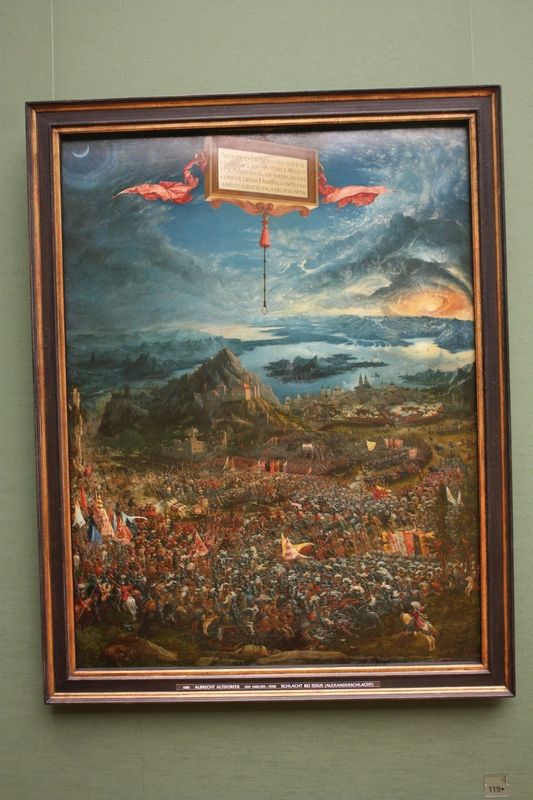 It was painted by Albrecht Altdorfer in 1529. We interrupt your regularly scheduled home improvement post to go on vacation! This crappy Lufthansa Airbus A340 is our cramped home for the next 8 hours on the way to spending the next two weeks jaunting around Europe. 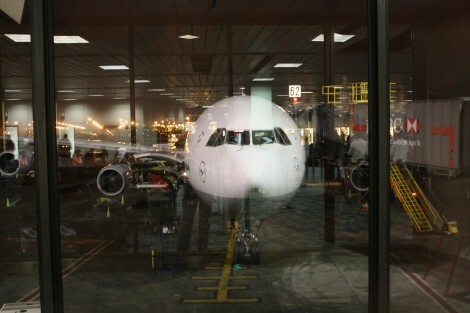 We’re going to be flying into Munich where I will be picking up my new car, and doing some sightseeing. Then we’ll be going to Salzburg for some more touristy stuff on our way to Cortina, in Italy where I’ll get to do a bit of skiing. From there its back to Austria, this time to Innsbruck, and then back to Munich. Voidsmith.com | Mantra Theme by Cryout Creations | Powered by WordPress.